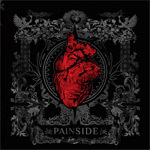 Hailing from Brazil, an international hotbed of heavy metal, Painside appears with a strong debut on Dark World Burden. Traditional influences are evident in Painside's sound ranging from the melodic heavy metal of Iron Maiden or Judas Priest to more the more agressive thrash of Metallica and others. The pace from the start is assertive and formidable driven by a vigorous rhythm section which roars like a runaway train. Guilherme Sevens is true heavy metal (with clean) singer sounding both bold and frightening in his intensity. The guitar work blisters with a classic style with plenty of freedom fly on every song. While Dark World Burden pounds away with aggressive heaviness, this is wrapped up in melodic sensibility. All these things are heard throughout, yet I would point to Ignite the Fire, Where Darkness Rules, Sand Messiah, and Redeemers in Blood as representative and impressive tracks. The only difficulty some may find is the certainity of the music itself. Pushing through Dark World Burden, by the second or third song you will easily recognize a singular theme of that assertive, yet melodic, heaviness. In other words, some may find this subtle redundacy to be a lack of compositional diversity. Nevertheless, while this may be somewhat true, Painside's Dark World Burden is representative of classic heavy metal made relevant for today, with an enegertic and entertaining vitality and sound. Recommended. Painside's Dark World Burden is representative of classic heavy metal made relevant for today, with an enegertic and entertaining vitality and sound. Recommended.